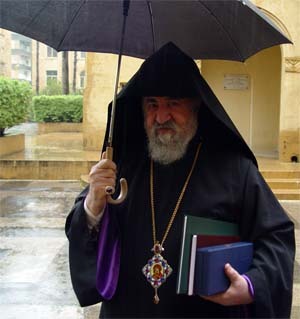 A rainy day greets Bishop Dirayr as he makes his way to the large conference room in the residence just down the hall from my room, to prepare for the celebration of Sourp Krikor Loussavoritch (St. Gregory the Enlightener.) The Cathedral has been slowly filling to capacity for this great feast celebrating the first Catholicos of the Armenian nation and the father of Armenian Christianity. Dirayr Serpazan is in fine humour, shortly after this photo is taken he greets three teenagers, sitting on a bench, with a warm wide smile he says, "What, we don't stand to greet a bishop anymore?" And the three spring to their feet in embarrassment and Serpazan responds with a hearty chuckle. Inside the conference hall, vesting the bishop is a team effort. Here Deacon Tro — whose fine tenor voice will serve in the chanting of the Gospel this morning — looks on as Fr. Norayr makes a final check to see that all is buckled, buttoned and in order. 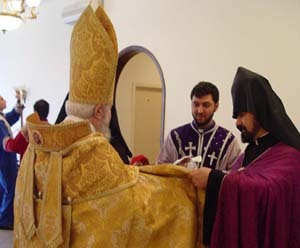 In this photo we can see the two bands or tassels called Artakhourak worn from the Vakas, or apparelled amice (high collar) of the bishop, rather than from the back of his mitre as is the custom in the western church. When all is ready, the signal is given to sound the bells, the long line of acolytes at the beginning of the episcopal procession starts down the stairs, and the scout troops assembled for the occasion take their places in the pouring rain, to line the route of the procession. 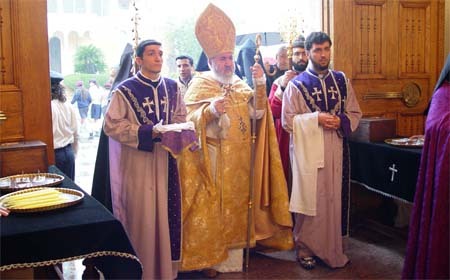 Bishop Dirayr can be seen approaching the Cathedral, underneath three umbrellas, with the two incense deacons or thurifers leading the way. 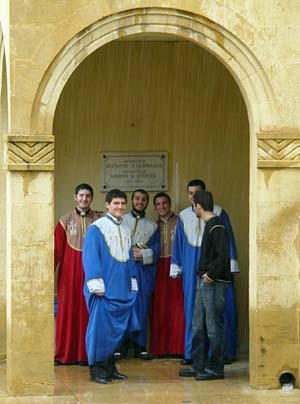 Finally Dirayr Serpazan arrives at the entranceway accompanied with Deacon Berj to his right (left in the photo) and Deacon Tro to his left to the Cathedral, the congregation stands and a great hymn is intoned. The main event of the day today, what has really drawn the crowds, begins during the liturgy. 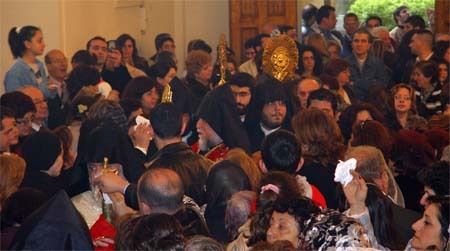 When the choir begins singing the Credo (the words of the universal Nicene Creed), the Cathedral bells begin to ring, and the Catholicosal procession escorts the Catholicos, Apostolic leader of the Great House of Cilicia, who walks behind a small silver casket, covered in white silk, bearing the golden reliquary of the right hand of the great Armenian patron, Sourp Krikor Loussavoritch himself. 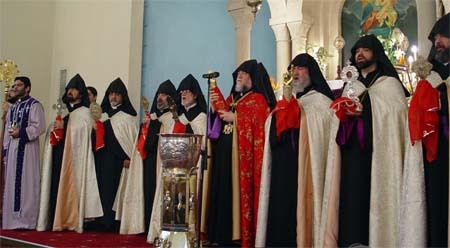 The relic is no doubt authentic, passed from down through the generations from Catholicos to Catholicos over the 1,705 years of Armenian Christianity. It is the sign of the authority of the Catholicos, as the heir of St. Gregory and is thus treated with tremendous reverence. 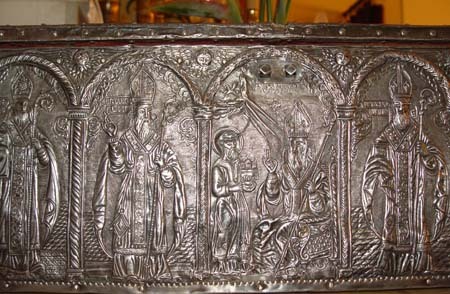 The right hand is stored in its hammered silver casket, pictured here, decorated with scenes from the life of the great saint. The casket and its treasure are kept secure, locked up in a safe, within the residence of the Catholicos. Once a year, today, it is brought out for the feast of St. Gregory, placed on the altar during the Anaphora (consecration of the bread and wine), and then processed along with the other esteemed objects in the Catholicosate's collection of relics. 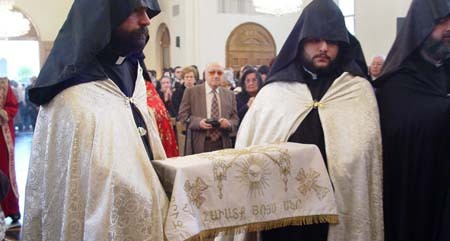 At the end of the liturgy, all of the clergy (celibate and lay) put on brocade copes (or capes) and venerable hand crosses and relics are distributed among them and carried in procession around the church, with the holy relic of St. Gregory the Enlightener carried by the Catholicos. The faithful have brought handkerchiefs and special cloths to rub against the crosses and relics as they come near, and the cloth becomes a focus of personal devotion for the following year. 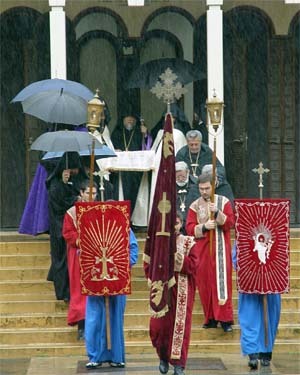 The annual procession is clearly a popular event; and though the rain today may have discouraged some of the faithful from attending the festive liturgy, it certainly has not succeeded in dampening the devotion of the faithful who have braved the weather to squeeze together, taking up every inch of available space within the Cathedral. Christians from the protestant traditions may wonder at all this attention given to the relics of the saints. Technically, the relics can be called "sacramentals" (sacred objects used in worship), their power is limited to that of evocation: their ability to stir up in the hearts of the faithful the awareness of God's grace. The procession of relics serves as well to remind us all of the great procession of the Church Triumphant, the living Church of Jesus Christ that includes not only those alive on earth today, but also all of the faithful of every age, alive and gathering still at the heavenly Throne of Glory singing, "Holy, Holy, Holy! Lord God of hosts, Heaven and earth are full of thy Glory. Glory be to thee, O Lord Most High." 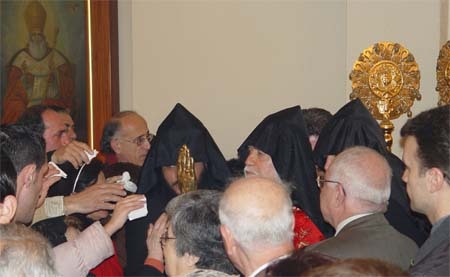 At the conclusion of the procession, the Catholicos and his monks and deacons gather on the sanctuary bema for the blessing of water (in the lavish silver and brass font, reserved for this purpose). With the solemn evocation of the Holy Spirit, the right hand of St. Gregory the Illuminator is used to bless the water which will then be distributed to the faithful. Other relics in the procession today include one of the Holy Cross (not pictured here) and the right hands of St. Sylvester (left) and St. Nicholas (right). 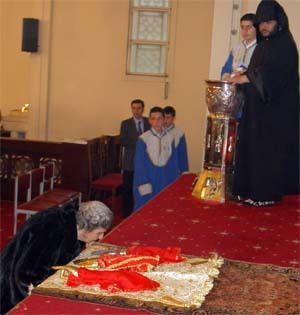 The three relics are then placed on a fine piece of embroidered silk at the front edge of the bema, so that the faithful can pass by and venerate the relics, with the usual double motion of Armenian hand kissing (first, a kiss to the back of the hand, followed, in a single motion, with the tipping of the head to touch the forehead to the hand as well.) 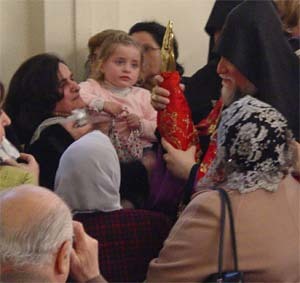 A great line forms of the faithful to venerate the relics and to receive a cup of the blessed water. The monks take turns through the day, distributing the water and guarding the relics, and there is a steady flow of pilgrims and visitors until the great feast comes to a close at sunset, the curtain closed, and we return to the duties and disciplines of Lent.